In Hear This, A.V. Club writers sing the praises of songs they know well—some inspired by a weekly theme and some not, but always songs worth hearing. This week, we’re picking our favorite comics-related songs. The Wedding Present is one of my favorite bands, and Seamonsters—released in 1991, recorded by Steve Albini—is generally considered its masterpiece. Even the B-sides from the era, which have been tacked on and re-released multiple times over the years—most recently in a triple-vinyl box—are uniformly excellent. That extends to “Dan Dare,” one of the only instrumentals in The Wedding Present catalog. It’s a short, peppy song that wouldn’t have made much sense as part of the brooding main album, though it does share a booming snare drum and strummy guitar sound with some of its siblings. The main guitar line takes the place of a vocal melody, and it’s aided by David Gedge doing some wordless “ah-ah”-ing in the background. 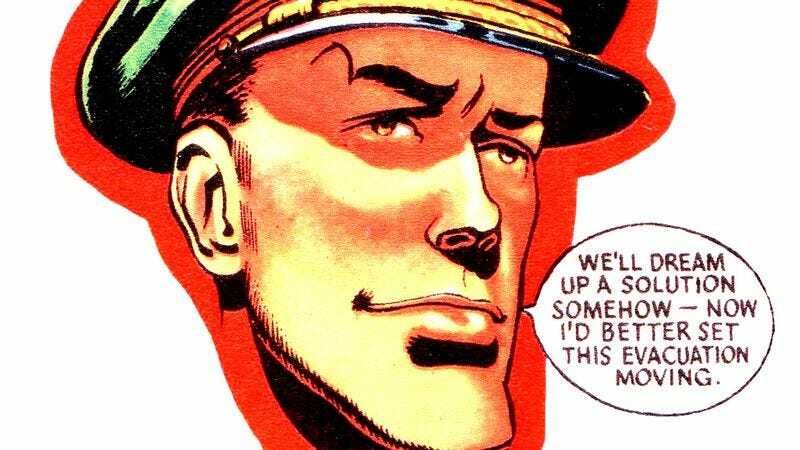 I didn’t know for years that Dan Dare is a popular British sci-fi comic hero dating back to the ’50s—I just assumed “Dan Dare” was a cool name for a song. It turns out that Dare has influenced lots of musicians in the U.K.: The Mekons are named after Dare’s arch-enemy, and his name pops up in lyrics by Elton John, David Bowie, and Pink Floyd. I’ve still never sought out the comics or TV specials—maybe it’s time.